TEHRAN, Iran -- All 10 U.S. Navy sailors detained by Iran after their two small boats allegedly drifted into Iranian territorial waters around one of Iran's Persian Gulf islands a day earlier have been freed, the United States and Iran said Wednesday. The sailors' swift release quickly defused what could have escalated into an international crisis days before Iran is expected to meet the terms of last summer's nuclear deal with world powers. The deal gives Iran significant relief from painful economic sanctions. A senior U.S. defense official told CBS News the American sailors are currently at a U.S. facility in Qatar. The nine men and one woman were held at an Iranian base on Farsi Island after they were detained nearby on Tuesday. The tiny outpost has been used as a base for Revolutionary Guard speedboats as far back as the 1980s. The Navy said there were no indications they had been harmed while in custody. Iranian state television aired later Wednesday dramatic sunset images of the moment the Revolutionary Guard forces boarded the American vessels and captured the sailors, showing them all kneeling on the deck, their hands on their heads. After their release, the sailors departed the island at 0843 GMT aboard the boats they were detained with, the Navy said. They were picked up by Navy aircraft and other sailors took control of their boats for the return voyage to Bahrain, where the U.S. 5th Fleet is based. CBS News correspondent Charlie D'Agata reported the American sailors were said to have been interrogated Wednesday morning by Revolutionary Guard forces on Farsi Island. The sailors will receive support to reintegrate with their unit, said 5th Fleet spokesman Cmdr. Kevin Stephens. He declined to say where they were traveling to or provide details on their identities. Stephens said the priority now is "determining ... how exactly these sailors found themselves in Iran. And that's something we're going to be looking at." 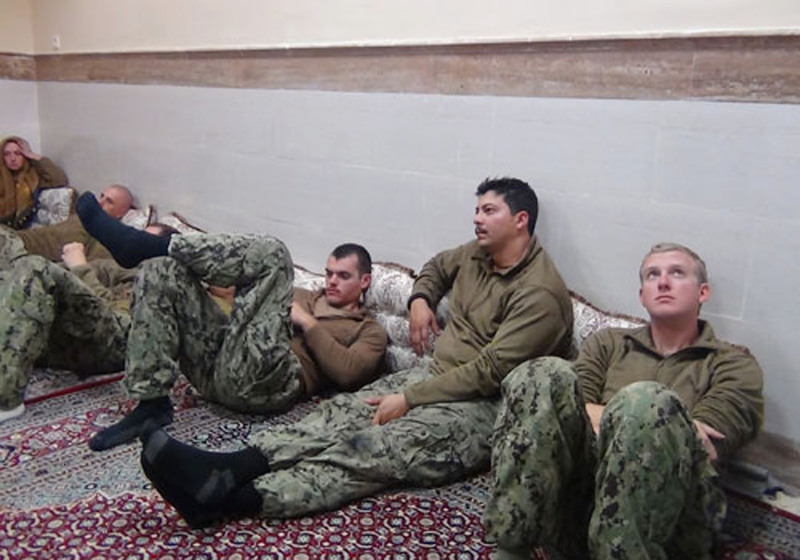 The Revolutionary Guard's official website published images of the detained U.S. sailors before their release, showing them sitting on the floor of a room. They look mostly bored or annoyed, though at least one of the sailors appears to be smiling. The sole woman had her hair covered by a brown cloth. The pictures also showed what appeared to be their two boats. "After determining that their entry into Iran's territorial waters was not intentional and their apology, the detained American sailors were released in international waters," a statement posted online by the Guard said Wednesday. Vice President Joe Biden, speaking later to "CBS This Morning," denied that Americans made any apology. "There's nothing to apologize for," Biden said. "When you have a problem with the boat you apologize the boat had a problem? No, and there was no looking for any apology. This was just standard nautical practice." While there was no official apology issued, Iran state television showed footage showing one U.S. sailor apologizing, calling the incident a "mistake." On Wednesday, U.S. Secretary of State John Kerry also denied an official apology was issued but he thanked Iran for their cooperation in releasing the sailors. "I think we can all imagine how a similar situation might have played out three or four years ago, and fact that today this kind of issue can be resolved peacefully and efficiently is a testament to the critical role diplomacy plays in keeping our country safe, secure, and strong," Kerry said. Gen. Ali Fadavi, the navy chief of Iran's powerful Revolutionary Guard, was quoted earlier Wednesday by Iranian state TV as saying that an investigation had shown the Americans entered Iranian territorial waters because of "mechanical problems in their navigation system." U.S. officials also blamed mechanical trouble for the incident. Fadavi said the American boats had shown "unprofessional acts" for 40 minutes before being picked up by Iranian forces after entering the country's territorial waters. He said Tehran did not consider the U.S. Navy boats violating Iranian territorial waters as an "innocent passage." The sailors were nonetheless allowed to make contact with the U.S. military, based on Iran's "responsibilities and Islamic mercy" late Tuesday, he said. Kerry, who forged a personal relationship with Iranian Foreign Minister Mohammed Javad Zarif during the three years of nuclear negotiations, called his Iranian counterpart immediately on learning of the incident, according to a senior U.S. official. Kerry "personally engaged" with Zarif on the issue, said the official, who was not authorized to discuss the matter publicly. Fadavi said Zarif "had a firm stance" during the telephone conversation with Kerry about the sailors' presence in Iran's territorial waters and "said they should not have come and should apologize." U.S. Defense Secretary Ash Carter said he was pleased with the sailors' release and he thanked Kerry for his diplomatic efforts. "Around the world, the U.S. Navy routinely provides assistance to foreign sailors in distress, and we appreciate the timely way in which this situation was resolved," Carter said. The quick resolution stood in contrast to Iran's March 2007 seizure of 15 British sailors and marines who were searching for a merchant ship in the Persian Gulf. Then, Iran held the British troops for 13 days in what the captives later described as cold stone cells, saying they were blindfolded, feared being executed and were coerced into falsely saying they had entered Iranian waters. The Britons' detention at the hands of the Revolutionary Guard came under hard-line Iranian President Mahmoud Ahmadinejad. A day after the naval team was seized, the U.N. Security Council imposed more sanctions on Iran for refusing to halt uranium enrichment. The Guard's 200,000-strong force is different from the regular Iranian military and is charged with protecting the ruling system. Its naval forces are heavily dependent on armed speedboats that can be used in teams to swarm much larger vessels. The incident came amid heightened tensions with Iran, and only hours before President Obama was to deliver his final State of the Union address. It set off a dramatic series of calls and meetings as U.S. officials tried to determine the exact status of the crew and reach out to Iranian leaders. Pentagon spokesman Peter Cook told The Associated Press late Tuesday U.S. time that the sailors' boats were moving between Kuwait and Bahrain when the U.S. lost contact with them. The sailors were part of Riverine Squadron 1 based in San Diego and were deployed to the U.S. Navy's 5th Fleet in Bahrain. When the U.S. lost contact with the boats, ships attached to the USS Harry S Truman aircraft carrier strike group began searching the area, along with aircraft flying off the Truman. The Riverine boats were not part of the carrier strike group, and were on a training mission, the officials said. The craft are not considered high-tech and don't contain any sensitive equipment, so there were no concerns about the Iranians gaining access to them, they added. The officials spoke on condition of anonymity because they were not authorized to discuss the sensitive incident publicly. In an earlier incident, in late December, Iran launched a rocket test near U.S. warships and boats passing through the narrow Strait of Hormuz, the route for about a fifth of the world's oil. Last February, Iran sank a replica of a U.S. aircraft carrier near the strait and has said it is testing "suicide drones" that could conduct kamikaze missions on naval ships. It has also challenged foreign cargo ships operating in the Gulf, opening fire on at least two in April and May. In one of those incidents, Iran temporarily seized a Marshall Islands-flagged cargo ship over what it said was a commercial dispute before releasing it with its crew more than a week later. Meanwhile, Iran was expected to satisfy the terms of last summer's nuclear deal in just days. Once the U.N. nuclear agency confirms Iran's actions to roll back its program, the United States and other Western powers are obliged to suspend wide-ranging oil, trade and financial sanctions on Tehran. Kerry recently said the deal's implementation was "days away."